Rob Weissbaum proudly displays a colorful tattoo of intense blues, greens and red-orange, a scaled koi fish twisting its way up his arm and metamorphosing into a fanged dragon at his shoulder. The body ink for him represents his survival of a traumatic skydiving accident that set him back physically, but never seemed to dampen his impermeably positive spirit. Today, Rob is Crested Butte’s Emergency Medical Services chief, a new position that evolved from the EMS coordinator. Rob was born in Chicago but raised in Ann Arbor, Mich. His father worked for Edison Electric, and his mom was a chef by trade. Rob and his sister were allowed, in his own words, “to do everything as kids. Back then, Dad gave us free rein. Parents weren’t as protective as they are these days, but when the porch light came on, you better be home for dinner and homework.” They ate meals together as a family and grew up without a TV, which was conducive to spending a lot of time outdoors and doing other activities. Rob says, “We were really involved in sports and extracurricular activities. I was a hockey player, and also played baseball. I’ve studied martial arts since I was six, when my mom got me into Tae Kwon Do.” Rob competed in the martial art, earning a 5th Dan Black Belt, of the eight it takes to qualify as Master. He graduated from high school in 1999 and enrolled at Eastern Michigan University in Ypsilanti, where he thought that he wanted to be a marine biologist but, he laughs, “As I researched it more I realized I was looking at a life of struggle,” not only the studies but the career. 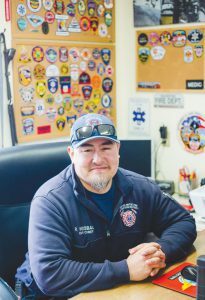 “So I went with my backup—to be a firefighter.” He had taken all AP classes in high school so he became bored with the business classes he had enrolled in and felt, “It was time to focus on firefighting. As I started talking to people about it, everyone told me to get my EMT first, so I immediately signed up to take that program,” which was four months of intensive classes in Ann Arbor. He completed the course by the end of 2000. In 2002, Rob was working on getting his pro skydiving license and on July 12 was doing his 18th jump of the 20 needed to qualify. “It was my second jump of the day. My parachute had deployed fine, but as I’m coming down, I got a big gust of wind and ended up taking a hard turn, called a swoop turn. I was about 100 feet too low when I initiated that turn and realized I was going to crash. I prepped for the hard hit, and after I hit the ground and looked at my legs, both my feet were faced backwards and bones were sticking out of both legs. As a paramedic, I thought, these are the coolest fractures I’ve ever seen. The best part about it was that I was begging somebody to go grab a camera.” The breaks were right at the ankles and he was at risk of losing one leg but after 10 hours of surgery, his doctors were able to save both legs. He was in rehab for an entire year. “My crew took care of me, making sure I had insurance coverage and support. I’m not skydiving anymore,” he confirms. After six years in Detroit, Rob felt he wanted to do more. “I was getting burnt out on the busy-ness of working the city job and I wanted to progress further with medicine and advance my career.” While he was working as a paramedic, Rob began six months of firefighting training, becoming certified as a Firefighter 2 in 2003. He’s been certified as a Critical Care Paramedic for eight years now, with much of the training learned on the job after passing the test. Rob packed up and left the Motor City of Detroit and all its nonstop trauma to take a job as a flight paramedic in Chandler, Ariz. in 2006. “I had never been there but I just picked up and left,” he says—in fact, he had never even been out west.